A rhythm game is a videogame that asks players to follow a beat and execute prompted actions like button presses (or guitar strums) at preset times. When you boil this type of title down to its core, they're usually not much more involved than a game of Simon Says, but somehow the music and the visuals come together into something addictive and much more fun than the four-toned plastic-buttoned game. These days, it seems like everyone is talking about Guitar Hero and Rock Band like they're the only music/rhythm videogames out there. Without doubt, they're the most popular ones ever made, but we'd like to see younger gamers and less versed ones broaden their horizons a bit. For this reason, we've pulled together a top ten list of the best rhythm games that don't use a plastic guitar. I know it's hard to imagine that guitarless world, but bear with us. Rhythm games prompt gamers and gauge their timing of rhythmical input through various means. These are not to be confused with games that create or promote musical interaction, like Rez or Vib-Ribbon. The same goes for performance games; as much as I love them, they're out. That being said, many musical games are a hybrid of game play types, letting players mix rhythmic play with performance or creation. We'll consider these fair game for our list. 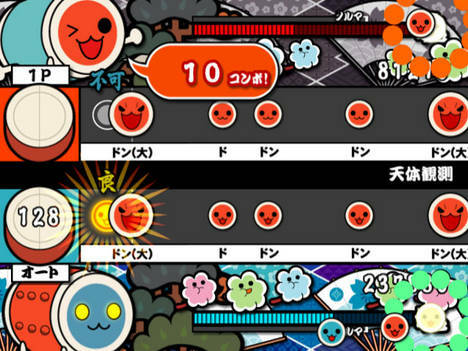 Taiko is about as simple as you can get for a rhythm game. Using two sticks (or styli), you pound on a drum as visual cues come across the screen. If that concept sounds silly, it's because it's supposed to. Some crazies at Namco even opted to make the in-game characters taiko drums with faces. This simple yet approachable game play, combined with colorful visuals and an infectious track listing, made for a game that's easy to pick up and hard to put down. The title isn't as popular in the US as it is in Japan, but arcade machines in both territories always manage to draw a crowd when sticks are flying. One of the key elements in a successful rhythm game is style, and the Dreamcast title Space Channel 5 had it in spades when it launched in the late 1990s. Originally developed to appeal to both male and female gamers, the title featured simplistic question-and-answer memory rhythm phrases as game play. But it was the stylistic choices and visual design that made Space Channel 5 stand out, with players controlling Ulala, a dancing reporter that used her moves to fend off aliens. And who couldn't love a game where Michael Jackson guest stars? On second thought, don't answer that. While this list omits games with guitar controllers, nobody said anything about maracas, so the Dreamcast classic Samba de Amigo is fair game. Instead of mashing buttons to the beat, Amigo armed players with motion-sensing maracas and prompted them to shake them at the proper time and in the proper position to proceed through Latin-flavored songs. If playing samba music with maracas as a happy monkey in a sombrero doesn't make you happy, I don't know what will. 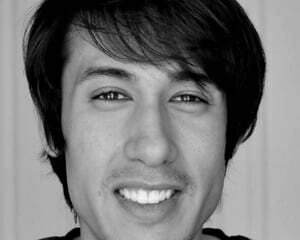 When life gets you down, don't you wish a male Japanese cheer squad would pop up out of nowhere and save you? Even then, I doubt a real-life squad could ever be as charming and hilarious as the guys in the Ouendan games are. Players save the day with cheer by taping and sliding the stylus to the beat as crazy stories happen in the background. Much of the charm of the titles lies with the manga art and crazy Japanese music. Elite Beat Agents, a US sequel, was good in its own right, but somehow lacks the energy that both the Ouendan imports have. The Donkey Konga series of games is actually related to our number 10 listing, Taiko no Tatsujin. The same developers at Namco created this title for Nintendo for the GameCube, using a modified version of Taiko's game engine. Instead of beating on taiko with sticks, this version had special controllers shaped like bongos, and were to be played with the hands. A microphone also sensed hand claps, adding another dimension to the rhythm gameplay. Other than this, the gameplay was very similar to Taiko, with players following visual prompts to hit the drums. The mix of taps and claps, combined with the ability for 4-player action, made for a great party title for everyone except for the neighbors. This Japan-only rhythm game starts players out easy, with a couple of DS face buttons mapped to rhythmical prompts for various J-pop, classical, and even animation and game songs. As the game and difficulty progresses, players find themselves using nearly every button on the DS, fingers flying, as for most songs each button represents a different musical note. This is one of the few game series that actually has users playing individual parts, like bass, keys, guitar, and drums. A multiplayer mode allows friends to take other instrument parts, allowing you to come together as a sort of band. The recently released sequel, Daigasso 2, has a creation mode where users can make their own levels and upload them to Nintendo Japan's Web site, making for almost endless gameplay. Who would have guessed that one of the forefathers of the highly successful rhythm game genre would be a rapping dog? PaRappa the Rapper had incredibly simplistic gameplay, asking the player to press buttons in a specific order on a specific beat to "say" words in a question-and-answer rap session. It was the infectious music and outrageous graphic design that drew gamers in, though. Where else could you have a rap showdown with three other opponents for rights to use the only open toilet? A sister game, UmJammer Lammy, was also created by NanaOn-Sha. This title exchanged a rapping dog for a guitar-playing lamb, but the visuals and music were even more bizarre this time around. Back in the late 1990s, Enix decided to get into the blossoming rhythm game scene with Bust a Groove. The dance/rhythm title featured core gameplay very similar to that of PaRappa the Rapper, but included battle elements, letting players have a "dance off" with another player or the CPU. Players picked from several characters, ranging from breakdancers to disco kings. One of the main draws to the Bust a Groove series is the soundtrack, which has players facing off to everything from Motown to hip-hop. Silly character designs, like an overweight hamburger-eating dancer, also helped make this a rhythm game classic. Rhythm Tengoku (Rhythm Heaven) follows the established formula of strange visuals and situations combined with great music. The series got its start as a Japanese Game Boy Advance release in 2006, where Nintendo's WarioWare minigame gameplay was combined with musical aspects and even wackier design sensibilities. For most minigames, the objective is to control some on-screen character or object in time with a song's beat. It seems simple at first, but as levels progress, the need for a good sense of rhythm becomes apparent. The series has since gone international with the announcement of Rhythm Heaven, a localization of the DS title Rhythm Tengoku Gold. Japanese musician Mitsuo Terada is back in this sequel with a batch of original songs so addictive that you'll find yourself replaying levels you've already beaten. The PlayStation 2 title Gitaroo Man set out to be creative and different from the rest of the rhythm games out there. In this title you play as Yuuichi (U-1), a loser-turned-hero due to the power of a guitar, with some help from a talking dog. Instead of simply mashing buttons to a beat, Gitaroo Man has players in a sort of musical battle, charging and guarding from musical attacks by following a "trace line" with the analog stick to play and blocking attacks with button presses. The gameplay is quite a bit more involved than other rhythm games, and sometimes also very challenging, but in the end very rewarding to play. The music, performed by COIL, made Gitaroo Man stand out among its peers, with songs ranging from rock to jazz, and even a great love ballad. Yuuichi battles enemies that play different instruments, with most battles (and songs) ending in a powerful duet, complete with harmonizing. This level of integration between the gameplay and the music makes Gitaroo Man a rhythm gaming experience like no other.